NatureWord – Trustworthy health information resource. The Japanese spider crab (scientific name Macrocheira kaempferi) is a species of long-legged spider crab belonging to the Majidae family. It is also commonly known as the giant spider crab, a name suggestive of its impressive size. The Japanese spider crab has gained immense popularity due to its extremely long legs, but also the quality of its meat which is both a source of nutrition and subsequent benefits as well as a delicacy, the fine texture and faint sweet taste of the meat contributing to its appeal. Fact 1: The Japanese giant crab is the largest crab. Its stretched claws reach a 4-5 meters or more. Despite the long leg span, the shell is less than 50 cm in width, but weighs up to 20 kilograms. Fact 2: It is close in size to the American lobster the largest . Fact 3: Their thin, long legs are weak and it is not uncommon for the crab to lose one or more limbs. Fact 4: It is a marine species and is known to live in the seas around Japan, hence its name. Fact 5: It lives deep in the ocean, at over 300 meters depth. Fact 6: It is not an aggressive animal, but is known to produce injuries with its claws. Fact 7: It eats algae and other sea plant material as well as sea animals, its diet including larvae, worms, slugs, snails, clams, oysters, mussels, krill, shrimp, smaller crabs or lobsters, even small fish, alive or not. Fact 8: The species is both fished in the wild and grown in fisheries for human consumption. Fact 9: It’s not only good to eat, but its meat is considered a delicacy and a source of good nutrition. What do Japanese spider crabs look like? 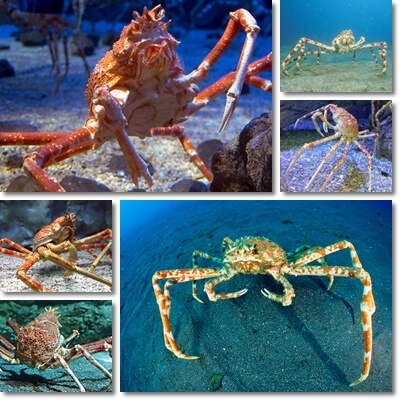 Japanese spider crabs stand out as having bulky, rounded bodies, slightly triangular towards the head, a particularly hard shell and thin, disproportionately long, but muscular, spider-like legs. The species has rounded bumps and short, sharp projections on their vividly colored shells. Shell color is mostly a bright orange-red with white spots. The crabs are white underneath the bellies and long legs. This particular coloring helps them camouflage avoid predators. Lastly, the front legs are clawed towards the end, allowing the crabs to pry open shellfish to feed or defend themselves against predators such as octopuses or fishermen. Overall, they look like giant, nightmarish spiders, hence their name. What does Japanese spider crab meat taste like? The Japanese spider crab is not just the biggest crab, but also a culinary delicacy. In addition to being a plentiful source of meat, it is good-tasting too. The meat of the Japanese spider crab has been described as flavorful, delicately sweet and light. The claws and long legs provide a predominantly white-colored meat (with the occasional reddish tinge), whereas the body of the crab is a source of brown-colored meat. The meat from the legs and claws is lighter, higher in protein and has a flaky texture, whereas the meat from the body is fattier, with a softer consistency due to the presence of significant amounts of healthy Omega-3 fatty acids, but also cholesterol and other fats. The meat of the Japanese spider crab is nutritionally similar to crab meat in general in the sense that it is an important source of several essential vitamins, minerals as well as protein, healthy EPA and DHA Omega-3 fatty acids and cholesterol. If consumed in reasonable amounts, it contributes to good overall nutrition. 1) Light meat, low in calories: about 80-90 kilo-calories per 100 g of meat. To be noted: the white, leg and claw meat is leaner and lighter and thus also lower in calories than the brown shell meat. 2) High-protein: 15-20% protein by weight, or 15-20 g of protein per 100 g.
3) Low in fat: approximately 1% fat, or 1 g of fat per 100 g of lean, leg and claw meat. The brown meat of the crab body may be higher in fat, but not excessively. 4) Source of cholesterol: between 50-100 g. Content varies according to type of meat (white or brown), age, diet and physiology particulars of the crab. 5) High in Omega-3 fatty acids in the form of EPA and DHA, the two most coveted types. 6) Rich in B vitamins, especially vitamin B12, but also B3 and B9. 7) Important source of potassium, phosphorus, sodium and zinc. 8) Good source of calcium, iron and magnesium. 9) Trace amounts of iodine, selenium, chromium and other essential minerals. 1) Good food for gaining muscle and bulking up thanks to a high protein content. 2) Low in calories and fat, the crab meat supports weight loss and contributes to maintaining a healthy weight. 3) The generous amounts of Omega-3 in the brown meat support memory and learning and combat brain fog. 4) Cholesterol and vitamin B12 protect against cognitive decline in aging adults. 5) Omega-3 EPA and DHA forms in the brown meat and vitamins B12 and B9 help with brain development of babies during pregnancy. 6) Benefits for fertility from healthy Omega-3 and cholesterol in the brown meat (cholesterol helps make hormones). 7) Strong bone frame and strong teeth from phosphorus, calcium and magnesium. 8) Benefits for blood pressure and overall cardiovascular system from magnesium, potassium and Omega-3 with anti-inflammatory action. 9) Potential benefits for mental health (example: better mood) thanks to the presence of all essential amino acids in the crab meat which help synthesize neurotransmitters for the brain. 10) Better energy levels from B vitamins, especially vitamin B12 and iron. 11) The high amounts of vitamin B12 and iron in Japanese spider crab meat restore vitality and combat fatigue, exerting anti-anemia properties. 12) Potential (minor) benefits for thyroid health and consequently also fertility from trace amounts of iodine and selenium. 13) Stronger immune system thanks to zinc. 14) Better, healthier, younger looking skin thanks to B vitamins, zinc and fats such as Omega-3. 15) Antioxidant benefits from iron, zinc, copper and the antioxidants present in the reddish meat. 1) Allergic reactions. The Japanese spider crab is a crustacean and can elicit allergic reactions in those allergic to crabs and other types of crustaceans. The reaction can be so severe it can lead to anaphylactic shock which is a life-threatening medical emergency requiring immediate medical assistance. Avoid the crab species (and also other foods you are allergic to) in all forms and preparations. 2) Risk for high blood pressure. Because it contains high amounts of sodium, Japanese spider crab is contraindicated in hypertension and should not be eaten too frequently or in too large amounts if you have high blood pressure. 3) High in cholesterol. Although the crab meat is low-fat, the brown part is high in cholesterol which makes it unsuitable for consumption by anyone with high blood cholesterol and associated cardiovascular problems. If you are advised to keep your cholesterol intake low, only eat the lean, white leg and claw meat. 4) Contraindicated in pregnancy. Often times, doctors will advise against eating crab or other seafood during pregnancy for various reasons. If the mother-to-be is allergic to crustaceans, she should avoid them completely. If it’s a matter of hypertension or high-cholesterol during pregnancy, avoid eating crab too often. To prevent food-borne illness or parasitic infections, cook your crustaceans thoroughly. There is an abundant choice of recipes for crab meat to suit all tastes and preferences. But considering the Japanese spider crab is a delicacy, recipes containing it are focused on emphasizing the natural flavors of its meat, with minimal interference from other foods or condiments. The crab meat can be eaten raw in sushi-like preparations with just boiled rice flavored with rice vinegar and maybe wasabi or lemon. For reasons that have to do with food safety concerns, Japanese spider crabs are either steamed or boiled and served either plain, with just slices of lemon or lime, maybe some fresh parsley or wasabi for those who love spicy food or a dressing of butter and herbs. Rarely are they served on a bed of vegetables in addition to lemon and a dressing. You can get as creative as you’d like with the dressing recipe for your Japanese crab and include anything from plain salt and white, red or black pepper to fresh parsley, dried oregano, dill or celery seeds, garlic, horseradish, ginger or paprika, with a base of either butter or extravirgin olive oil. However you may choose to prepare your Japanese spider crab, remember it’s best to cook it thoroughly to avoid food-borne illness. And know that the savory meat only calls for minimal flavoring in the form of either a few lemon or lime slices or a preferred spice or condiment mix and doesn’t require pairing with other foods unless you like it like that.